A Los Angeles-based producer plans to bring Terry Fox's story to a global audience with a new film about his 1980 Marathon of Hope. Toronto-raised Kelly Slattery of Los Angeles-based Therapy Content announced plans for Terry Fox: The Feature Film on Friday, the anniversary of the beginning of Fox’s run across Canada to raise money for cancer research. She has started a Kickstarter campaign to back the film, saying any proceeds of the feature, to be released in 2014, will go to The Terry Fox Foundation, which supports cancer research. 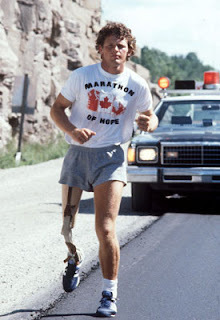 Fox, who had lost a leg to bone cancer, dipped his artificial foot into the Atlantic Ocean off St. John's on April 12, 1980, and began running across Canada in aid of cancer research. Fox, 21, ran for 143 days and was cut short in his journey because of the recurrence of cancer. He died on June 28, 1981, but by then he had captured hearts across the country and become a national hero. Slattery recalled how her father, an Adidas executive, was touched by a letter he received from Fox asking for support. "Terry Fox was a religion in our home,” said the Toronto-raised producer. “To my family, he represented a selflessness that is rarely seen in the world today." Slattery has secured film development rights for Terry Fox: The Feature Film and has the co-operation of the Fox family, she said in a press release. "We are excited by the opportunities offered in a theatre release to share Terry's vision and values with a global audience," Darrell Fox, brother of Terry, is quoted as saying. "We are very thankful for Kelly's intentions of generating revenue for cancer research, which go hand and hand with Terry's Marathon of Hope intentions of reducing the suffering caused by cancer." The Vancouver-based Terry Fox Foundation, which sponsors annual runs and other fundraisers in his name, has raised millions for cancer research in the past 33 years. Slattery said funds raised through crowd-funding site Kickstarter will go towards film production costs, so that more of the proceeds of the film can be put toward cancer research. Two TV movies have been made about Terry Fox's story — one in 1983 and another in 2005.